DECEMBER - PORCELAIN FLOWER OF THE MONTH MUG. 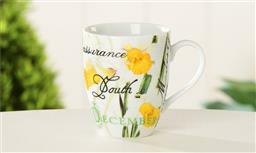 December Birth Flower Design 10oz. Porcelain Mug. Design features large Narcissus flower month and symbolic traits associated with flower in striking typography. Back of the mug details the story of both the Narcissus birth flower and December's Turquoise Birthstone. FDA Approved Food Safe.